Linley mini metronome without bell in gloss red finish. High grade synthetic casing with transparent front cover. 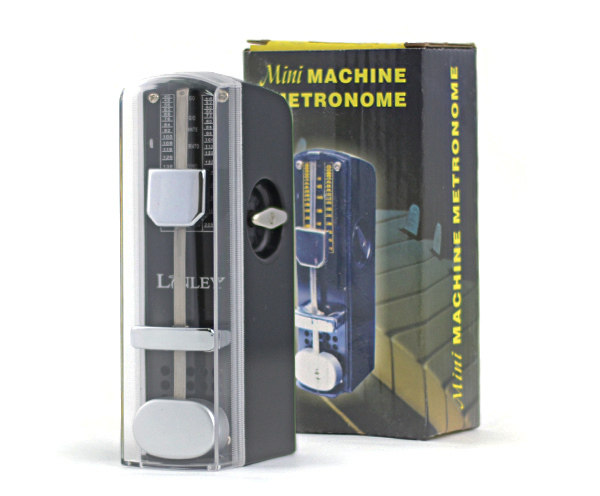 Linley mini metronome without bell in gloss black finish. High grade synthetic casing with transparent front cover. Ivory Wittner "Piccolo" Metronome. Without bell. Curved top. (832) The Wittner Piccolo metronome is a very dependable keywound metronome which is priced reasonably. The sound of the metronome has a good click and is highly portable. Blue Wittner "Piccolo" Metronome. Without bell. Curved top. (837) The Wittner Piccolo metronome is a very dependable keywound metronome which is priced reasonably. The sound of the metronome has a good click and is highly portable. Orange Wittner "Piccolo" Metronome. Without bell. Curved top. The Wittner Piccolo metronome is a very dependable keywound metronome which is priced reasonably. The sound of the metronome has a good click and is highly portable. Black Wittner "Piccolo" Metronome. Without bell. Curved top. (836) The Wittner Piccolo metronome is a very dependable keywound metronome which is priced reasonably. The sound of the metronome has a good click and is highly portable. Ruby Wittner "Piccolo" Metronome. Without bell. Curved top. (834) The Wittner Piccolo metronome is a very dependable keywound metronome which is priced reasonably. The sound of the metronome has a good click and is highly portable. Wittner Piccolo Metronome - "Leather Violet". Wittner Taktell Metronomes have a solid spring, therefore you may wind up the clockwork until you feel resistance. Important: If you wish to re-hang the pendulum after using the metronome then set the pendulum sliding weight at tempo 208. Doing so you avoid any scratching of the scale. Ruby 824 Wittner Taktell "Junior" Metronome. Plastic cased metronome without bell. Square top. Made in Germany. Black Wittner "Junior" Metronome. Without bell. Square top. (826) Mechanical metronome with plastic housing in black. Ivory 882051 Wittner Taktell "Super Mini" Metronome. Small square shaped plastic metronome without bell. Because of its size it will fit easily into the pocket of a violin case, etc. Made in Germany. Wittner Pendulum weight to suit Maelzel (Pyramid) & Prelude series. Wittner Pendulum weight to suit Junior & Piccolo models. Wittner Pendulum weight to suit Super Mini & Piccolino models. Wittner metronome key to suit the Junior, Piccolo & Super Mini models. Wittner metronome key to suit the Piccolino model.